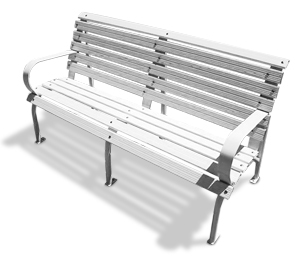 These Capitol Style aluminum benches are constructed of eleven 2-1/2" x 3/4" extruded aluminum slats	and two or three frame legs. 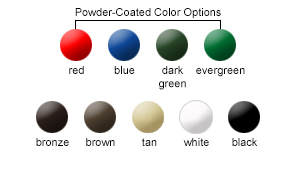 The bench slats and frame legs are powder-coated to your choice, of color options shown. Engineered with cross-bolting to prevent end play and keep aluminum planks in place. All Capitol park benches come standard without armrests, but optional single armrests are available to order. An additional center armrest is also available only for 60" or 80" length benches.